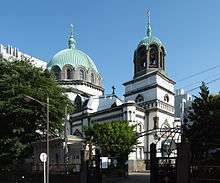 The Japanese Orthodox Church or the Orthodox Church in Japan (日本ハリストス正教会, Nihon Harisutosu Seikyōkai, OCJ) is an autonomous church within the Orthodox Church, under the leadership of the Russian Orthodox Church. St. Nicholas of Japan (baptized as Ivan Dmitrievich Kasatkin) brought Orthodox Christianity to Japan in the 19th century. In 1861 he was sent by the Russian Orthodox Church to Hakodate, Hokkaidō as a presbyter to a chapel of the Russian consulate. Though the contemporary Shogun's government prohibited Japanese conversion to Christianity, some neighbors who frequently visited the chapel converted in 1864—Nicolai's first three converts in Japan. 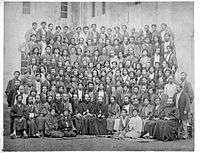 While they were his first converts in Japan, they were not the first Japanese to become Orthodox Christians—some Japanese who had settled in Russia had converted to Orthodox Christianity. Later, as the situation of the Orthodox Church improved in Russia, the Japanese Orthodox Church came under their leadership again. In 1970 the founder of the Orthodox Church in Japan, Nicolai Kasatkin, was glorified by the Patriarch of Moscow and is recognized as St. Nicholas, Equal-to-the-Apostles to Japan; his commemoration day is February 16. In 2000 the Russian Orthodox Church also canonized as a saint bishop Andronik (Nikolsky) who had been appointed the first bishop of Kyoto and had later as archbishop of Perm become a martyr during the Russian Revolution. As of 2007, the leader of the Orthodox Church in Japan is Daniel (Nushiro), Metropolitan of All Japan and Archbishop of Tokyo, elevated to his seat in 2000. It is estimated that the Church has some 30,000 adherents today. Derived with permission from Orthodox Church of Japan at OrthodoxWiki. ↑ Equal-to-the-Apostles St. Nicholas of Japan, Russian Orthodox Cathedral of Saint John the Baptist web-site, Washington D.C.
1 2 3 "日本の正教会の歴史と現代 "History of Japanese Orthodox Church and Now"" (in Japanese). The Orthodox Church in Japan. 2007-02-01. Retrieved 2007-08-25. ↑ "日本の正教会の歴史と現代 "History of Japanese Orthodox Church and Now"" (in Japanese). The Othodox Church in Japan. 2007-02-01. Retrieved 2007-08-25. ↑ "日本の正教会の歴史と現代 "History of Japanese Orthodox Church and Now"" (in Japanese). The Orthodox Church in Japan. 2007-02-01. Retrieved 2007-08-25. ↑ Orthodox translation of Gospel into Japanese, Pravostok Orthodox Portal, October 2006. ↑ "東京の大主教、全日本の府主教ダニイル "Daniel, Archbishof of Tokyo and metropolitan of all Japan"" (in Japanese). The Orthodox Church in Japan. 2007-02-01. Retrieved 2007-08-25. ↑ Православный храм откроется в еще одном городе Японии (in Russian). Interfax Russia. 2009-12-07. ↑ St. Nikolai of Japan and Japanese church singing, by Maria J. Matsushima, The Orthodox Church Singing in Japan web-site. Holy Resurrection Cathedral in Tokyo(Nicorai-do) Unofficial website.